I recently shared with you characteristics of an auditory learner and ways to effectively teach them God’s word (View it here). 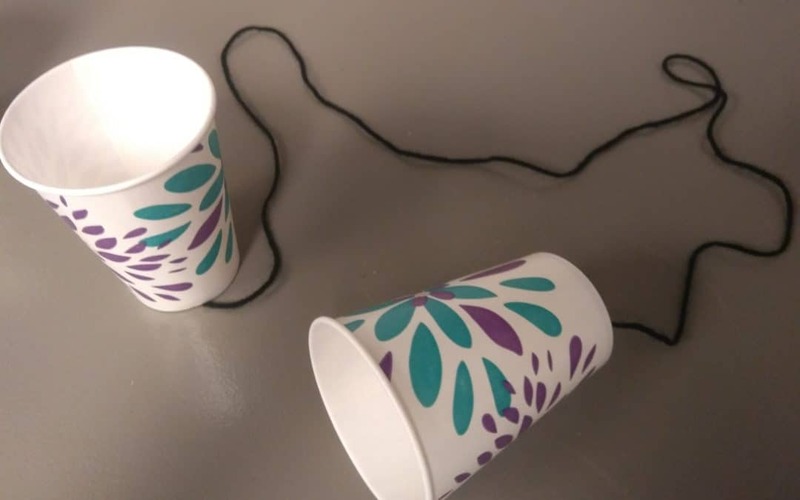 I thought we’d have some fun and make some stringed phones for you to try with your class. Tin cans look cool, but paper ones work best (and are easier) so that’s what I will do here. Step 1: You will need your supplies. 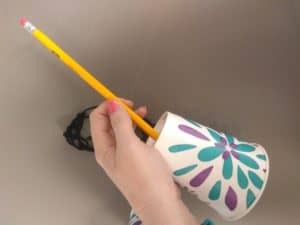 It’s just 2 paper cups and string (as long as you’d like). Oh, and something to poke a hole in each cup. I used a pencil tip but something a little smaller may be better. 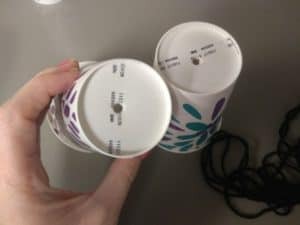 Step 2: Poke a small hole, just large enough to put your string through, in the bottom center of each cup. 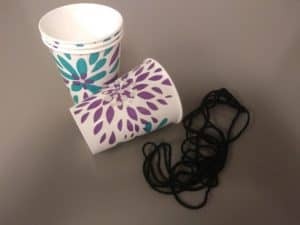 Step 3: Push string through the bottom of one cup, tying a knot on the string inside the cup. 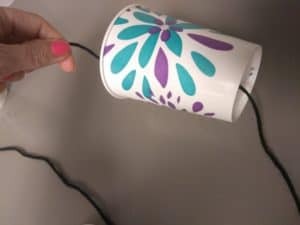 This will prevent kids from being able to pull the string out when tightening to talk. 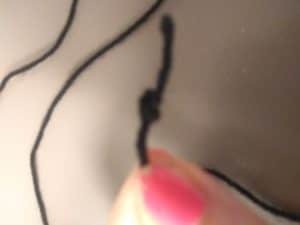 Step 4: Repeat with the other end of the string on the second cup and you’re done! You’ve got a stringed phone. 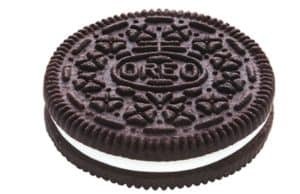 What’s food do you hate the most? Who’s your favorite person in the bible? Now for the lesson, the heart of the class where you share God’s word and pray that it sticks with them throughout their lives. Enthusiastically tell the bible story asking plenty of questions as you go. Now that they have heard the lesson, it’s time to reinforce it! The kids should be in pairs (if you have an odd number, the teacher participates too). Ask a question about the lesson. Keep questions short enough for kids to repeat. One person from each pair repeats the question in the can. The person listening now gives the answer. If the do not know it they say, “I don’t know, do you?” Now the first person gets a chance to answer back. After kids are done, the teacher gives the correct answer. Repeat asking another question alternating who asks the question into the can. Trust me. 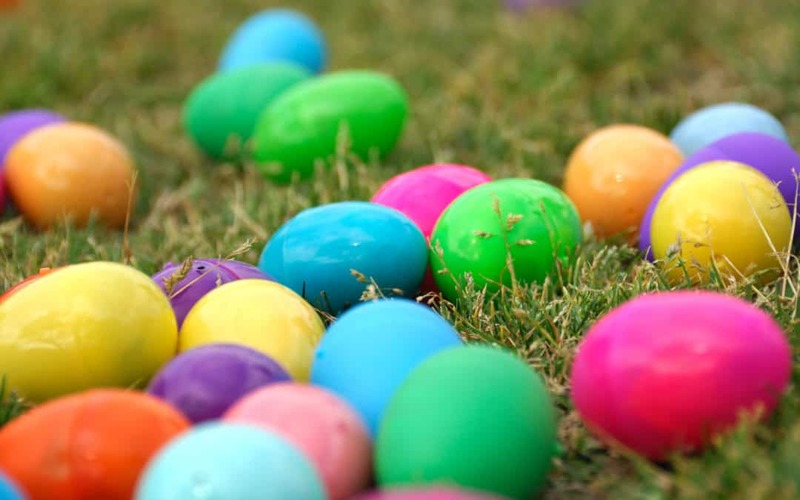 The kids will have a blast and learn so much! Only 30% of the general school aged population are auditory learners. Although it’s only 30%, it is vital we teach them in a manner they learn God’s word best. Hearing and speaking is their main method of learning. You’d think this means all you need to do as a teacher is read aloud to them and things are great. Not exactly. They are children so they need creativity in what they hear. Do this because studies show auditory learners remember up to 75% of what they hear. That’s no too shabby. 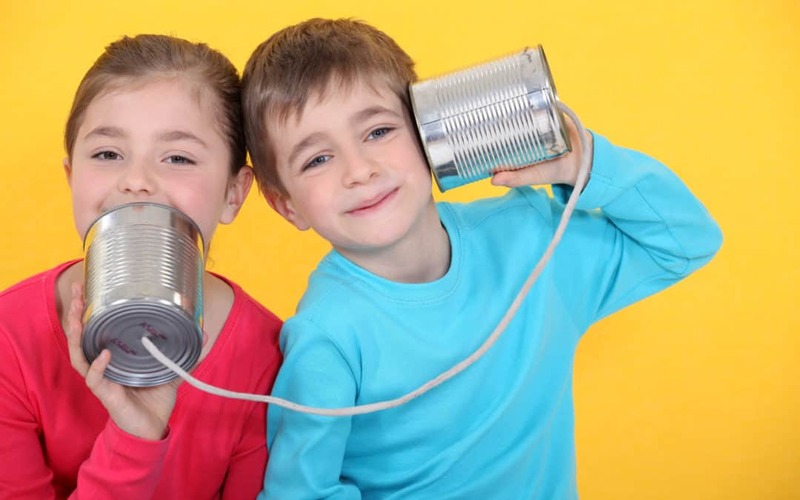 Reaching kids who learn best through auditory methods is important, especially when sharing God’s word, so how do we accomplish this most effectively? First we need to understand the auditory learner. Auditory learners learn by hearing and speaking, listening and repeating. 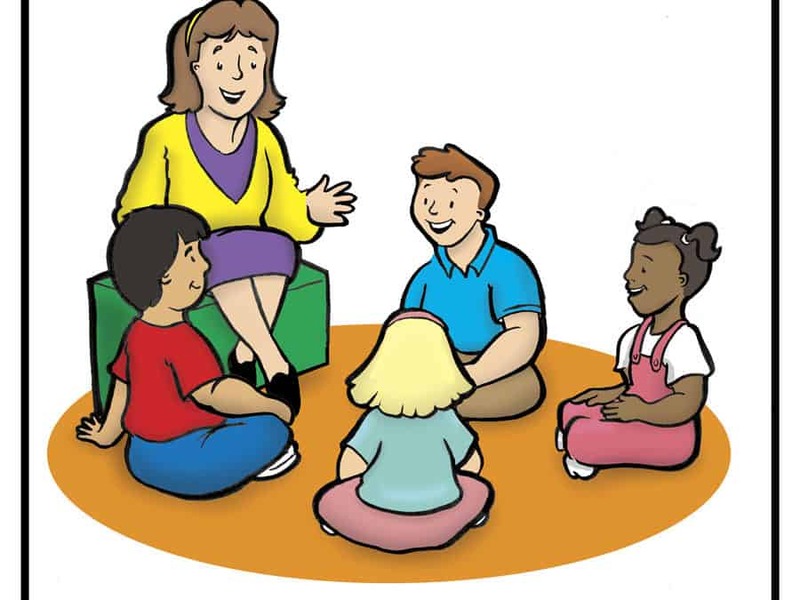 They enjoy class and small group discussions. They enjoy listening but they really cannot wait for their chance to talk. Of course, auditory learners often give long, repetitive descriptions so be prepared. It is difficult for them to sit quietly for long periods of time, of course, this is tough for just about any kid. Bible class teachers need to get creative in the delivery. God’s word is exciting! Unbelievable odds were overcome with God’s intervention. A young shepherd boy beat the odds against a giant. An unwilling participant overcame fear while in the belly of a fish. Together twelve undesirable men changed the world. Portray this when sharing with the children. Auditory learners respond to the high and low pitches in your voice, a soft whisper or a loud shout. Although your hands are not sounds, we often speak with our hands. Add a bit of this into the mix. Their interest is perked when you give the lesson oral textures, so get out of the box and give life through storytelling. Auditory learners respond well to speaking so have them repeat key points you make. Better yet, have kids listen for a specific word or phrase throughout your story and when they hear it, they respond with an action. This may be shouting the word or phrase back to you, clapping three times fast, or even jumping from their seats and sitting back down quickly. This keeps them on their toes and listening. For instance, as you read the Beatitudes, have children raise their hands with joy every time you read the word “blessed.” Have fun with this. They sure will! And do not forget to ask questions as you tell a story to reinforce points. Answering back helps them retain what is taught. Since auditory learners respond to words, the use of songs and rhymes comes in handy. Oral recitation can be fun and helpful, just try not to let it become boring and drab. If reciting a verse for instance, change up tones or speed throughout the verse to make it stand out. You might recite a verse turtle style, very slowly. Then you recite it cheetah style, super fast. Next you recite it Texas style, with accent and slapping your knee. Try angelic style. This is where they act like they are praying and sing the verse angelically. Add tough man style where kids show their muscles and use a strong man voice. Be creative with it. There are tons of ways to play this out. Auditory learners often enjoy talking to themselves so this is a great way to impress God’s word on them where it comes up time and time for them. A good teacher’s effective teaching methods are invaluable. They may not come naturally, but can be learned and developed with practice. Take time to remember what types of learners you are teaching and teach for them. Always be enthusiastic and involve the kids as much as possible. They will learn so much from you and look forward to going to your class each week. You will become the “fun” teacher they tell their parents and friends about. What bible class teacher doesn’t want that? Read more on characteristics of learning styles. Killer Lesson Plan. Poor Delivery. “The kids are going to love this!” I thought. “They get to play with slime all through class! They are going to invite their friends and beg to come back next week! 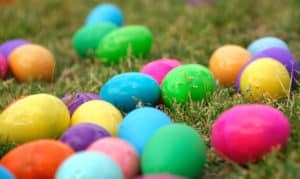 Our children’s bible classes are going to spill over with so many kids.” Well, that’s what I thought as I put the lesson together and excitedly set containers of sparkling galaxy slime at their seats. Unfortunately, I did not take into account the need for training others on presenting the lesson. I thought slime was full proof, but I was wrong. I was so very wrong. Kids need to know the bible is real and full of life. When you really look at the bible, and I mean really look, you will find so much interesting information as you turn the pages. Kids are fascinated as you point out strange or gross things from the scriptures. 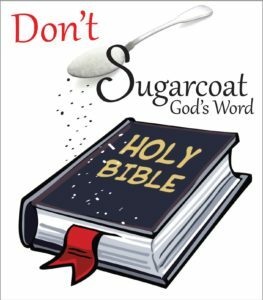 Don’t sugar coat God’s word. Kids are not interested in boring. They want on the edge of your seat thrilling! And how you share God’s thrilling message matters. Are you stoic or are you lively? Are you simply reading the words or are you giving them life? Teaching bible class does need to be fun for kids so they look forward to coming, but it is more than just the activity. Back to my experience I mentioned earlier, the kids were so excited when they walked through the door and saw slime, but that quickly faded. I was disappointed as I peeked through windows in doors to see kids with blank stares. They were far from engaged. In one of my elementary classes, the teacher was reading the lesson with guided instructions for what to create from their slime. So what was the problem? There was no life, no enthusiasm in the reading of the lesson. For kids to engage, you have to show them the bible is alive, show lots and lots of enthusiasm, of excitement. I decided to test my theory as I subbed for a class and wow! The kids had a blast, they learned and asked if they could have this for class again. Presentation matters. God’s word is fascinating when we tell it like it is. Just this past week I taught elementary kids about Joshua, a mighty warrior for God. He was on a roll defeating countries left and right as the Israelites took the land God had promised them. As he defeated nations, he captured kings and made a statement with their dead bodies. He stuck a pole through their bodies and put them up on display for a day. He didn’t do this just one time either. The kids were wide eyed and paying attention. They could not believe this was really in the bible. Show them how interesting it is and when the are paying attention, you can talk more about what we can learn from these accounts in scripture. Asking kids to put themselves in the bible individuals shoes helps kids relate, makes them real. As you talk about Adam and Eve walking through the garden with God, ask them what that might have been like. Can you imagine walking around your yard with God just like he was your best friend? Do you think this might have caused them to see God differently than we do? We look at him with awe, almost untouchable, but for them, God was always there. It may not have seemed like a big deal to them. We can begin to see people from scripture as human when we ask questions like these. The bible is far from boring so let’s make sure we portray it that way. Let’s help our kids engage in God’s word by sharing it with energy and enthusiasm. Give kids a reason to be wowed by God’s word! Stoic or full of life? Your decision may change the way a child relates to God’s word so give it your all. I have the Tasmanian Devil in my second grade class. She interrupts, blurts out comments that are completely off topic, walks around the classroom during teaching, messes with the kids sitting next to her and at times, simply refuses to participate. A study by the Center for Disease Control and Prevention stated that according to a parent report from 2011-2012, approximately 11% of children ages 4-17 years old (6.4 million) have been diagnosed with ADHD. I am one that believes this condition is overdiagnosed; however, there are many, many children that really do suffer from this. And these are often our “problem” children. So how do we handle this as bible class teachers? If you have a child that is a discipline problem in your class, chances are, they are the same way at school. Their parents are used to hearing about their child causing problems for teachers but it doesn’t make it any easier to hear again and again. I was one of these parents when it came to my youngest. 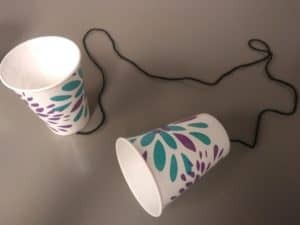 I would get calls that my daughter was walking around the classroom during instruction time, making noise with her pencils or fingers on the tables, and my favorite, barking like a dog at the other kids in the lunch line. She would never behave this way at home because she knew it was unacceptable; but at school, she was the child I am sure the teacher’s wished would stay home sick more often. Getting a call from her bible class teacher was the icing on the cake. Knowing the teachers were trying to work with my child, trying to find a solution was reassuring. Hearing that they found positive in my child helped me at the time; so please keep this in mind when addressing parents. Oreo! Positive – Negative – Positive. As a bible class teacher, we want our kids excited about coming to class! We also do not want our parents dreading a call from us or avoiding us at church, wondering what their child has done now. Take every opportunity to praise the kids when they do well and share good behavior with their parents. 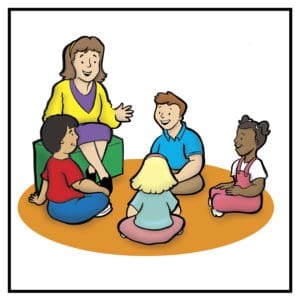 This encourages parents to come back again and again, knowing their child’s teacher knows how to teach their child and enjoys having them in class. And when you don’t enjoy it, look for alternative ways to teach, alternative ways to capture their attention. It’s incredibly rewarding when you find what works! These are kids so finding fun ways to teach typically does the trick. Bible class doesn’t have to be boring. It really doesn’t take much. I promise. God gave us the tools, we just need to use them. Kids should be so excited to hear another story from God’s word that they beg to come to class. Not possible, you say? We need the spot lights and movie screens, the band with jamming music. I disagree! They are bombarded with distractions everyday. Let’s make it fun while giving them something simple, but stimulating. Engage their minds. Kids beg to watch cartoons. They beg to play with friends. They beg you to tell them a bedtime story. Why? Because they enjoy these things. 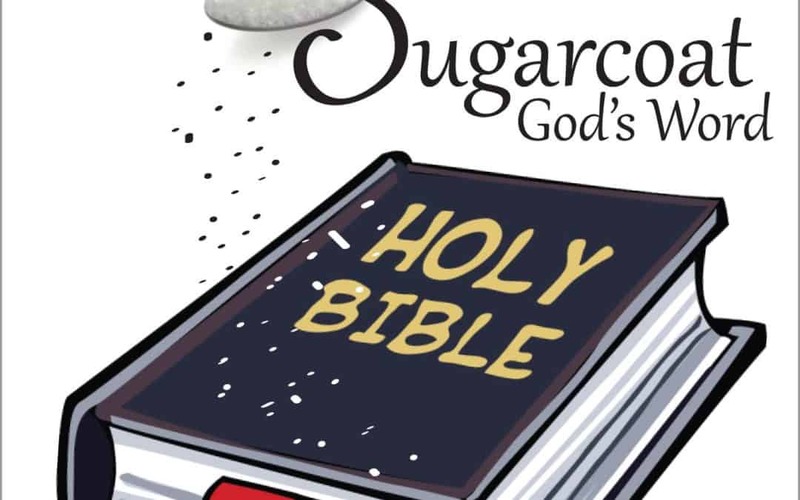 So what do these cartoons and story book readings have that the Bible doesn’t? Nothing! It’s all about the delivery. When kids watch cartoons, the characters come to life. They are often funny, strong, powerful or simply just like them. When we read stories to our children we often read with enthusiasm, lowering and raising our voices at key parts. We ask questions before we turn the page like, “What do you think will happen? Is someone going to save her? Will he fall off the cliff?” You get the idea. Now let’s apply this to bible class during story time. God has given us amazing true stories. David went up against a giant while experienced soldiers shook in their boots. Jonah was swallowed by a big fish only to be spit out 3 days later with a mission to accomplish. Queen Athaliah had her grandchildren killed for power. Moses spoke to a burning bush. Paul was in a shipwreck. Spies were lowered by a rope from Rahab’s window to escape the kings men. The list goes on and on. This is exciting stuff, but our kids sure don’t know it because we show them a few old, outdated pictures, or my favorite- flannel boards, and we tell the stories with little enthusiasm. This week, I challenge you to share a story from the Bible with a child and help them see how exciting it is. Use your face to express emotions and your hands for more effect. Bang on the table to really get their attention at action packed parts of the story. Encourage kids to wonder what the Bible individual was thinking or feeling. What would they be thinking if there at that time? Get kids excited about knowing their God. As they learn more about who God is and how he works in the lives of people, they will grow a meaningful love for God and a desire to share Him with others.